Our State Magazine of North Carolina kicked off its April Issue with a very special Launch Party over in Chapel Hill recently. Taste of Southern was invited to attend and, we’d like to share some of the highlights about the event with you. Journey with us over to Crooks Corner Restaurant and lets take a peek inside the April-2013 issue of Our State: Down Home In North Carolina. 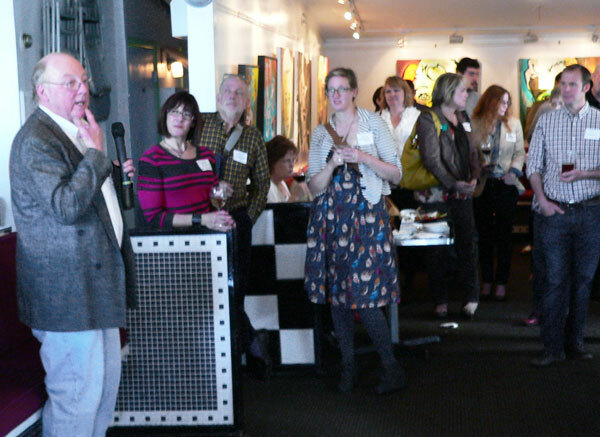 I was recently honored to receive an Invitation to attend the April Issue Launch Party of Our State Magazine, which was held March 19, 2013, at Crooks Corner Restaurant over in Chapel Hill, North Carolina. This was “Big Time Stuff” for me as it was the first time Taste of Southern has been invited to attend any type of event since we started our site back on January 01, 2012. I took this as a sign of progress for our little website of Southern Cooking recipes. It was much like the same invitation I had received back in April of 2012 from Our State Magazine to contribute a recipe or two for their Online Newsletter. Andy, the Digital Marketing Coordinator for Our State, sent me an email saying he had visited Taste of Southern and, he thought I might be interested in submitting a recipe for use in their monthly Newsletter. I was highly honored and quickly accepted. While I haven’t actually made the print magazine…YET… I do have a couple of my recipes that went out in the Newsletter and are still available on their website at OurState.com. This was the scene just inside the front door of Crooks Corner Restaurant in Chapel Hill as I arrived. I must admit that I arrived “fashionably late,” for the event but… it wasn’t my fault. No really, it wasn’t. I’ll spare you all the details of fighting traffic around Franklin Street, what with the gridlock at the stop lights and stopping for all the youngsters running across the street at every corner. Chapel Hill is a bit of a college town you see, home of the University of North Carolina and the Tar Heels. The Town of Chapel Hill website bills itself as “The Southern Part of Heaven.” Around here, everyone knows that God is a Carolina fan because he made the sky Carolina Blue. And, it was a beautiful Carolina Blue Sky type of day and warmer weather had just returned to our corner of the world. College students were in abundance all up and down the streets, many in shorts, running for exercise, from one end of town to the other. Parking was at a premium as I finally pulled up to Crooks Corner. An earlier Email had stated parking would be available around back of the restaurant and although I circled the block twice, there wasn’t an empty spot to be found. I ended up parking well over a city block away and walked to the restaurant. If only I had the energy of those college students, I might have got there on time but, I’m an old man and my knees and legs do all they can to just get me out the front door these days. I might have also been breathing a bit hard by the time I entered the restaurant. This is Bill Smith, Chef and Owner of Crooks Corner Restaurant with the microphone. 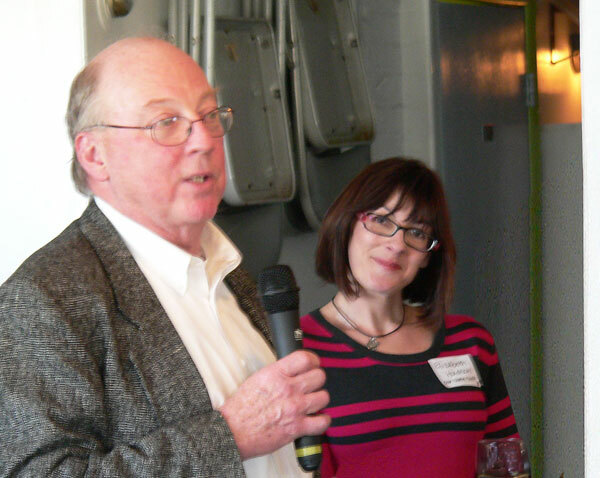 Right behind him is Elizabeth Hudson, Editor of Our State Magazine. See how she’s looking right straight at my camera and giving me a smile. I was all the way across the room and barely did get this picture with my camera but, it reminds me of the photo I took recently over at Southern Seasons when The Lee Bros. held their cooking class. Remember this photo I posted just a week or so ago? That’s Ted Lee on the left and Matt Lee on the right. See how Matt is looking right straight at my camera? 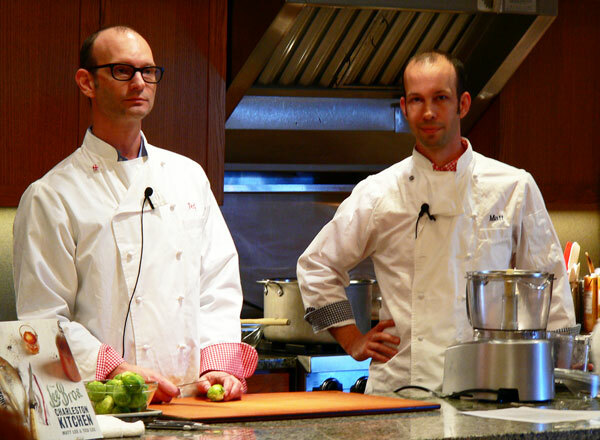 The Lee Bros. were in town promoting their new cookbook “The Lee Bros. Charleston Kitchen.” I attended a cooking class they were giving at A Southern Season and caught this photo. Two events, one week a part and, I get the same “looking right in my camera” type of photo. How cool is that? OK, so this may be just another way to get a shameless plug in for The Lee Bros. new cookbook. They weren’t at the Launch Party but, I bet they would have been had it been a week earlier when they were in town for several days. Lets move on. Ms. Hudson was introducing Chef Smith as I arrived. I’m truly sorry that I didn’t get to hear her comments about the April Issue. I may also be a bit envious of her job because, I follow her on Twitter and, she is all the time posting pictures of the many fabulous places she’s visiting across our beautiful state of North Carolina. I don’t know how she manages to be so small after eating at all those great restaurants she mentions either. I did get to introduce myself to her later. She has a very contagious smile and was still going strong even at the end of the party. I bet its because she had a really good parking space right at the door to the restaurant. Just saying. I also had the chance to introduce myself to Chef Bill. He has an article in the April Issue about how he grew up splitting his time between two different churches, one Presbyterian and the other Catholic. According to Chef Bill, “the Presbyterians had layer cakes and, the Catholics had Kibbe. His essay on the church supper makes for a good read and, I highly suggest you grab a copy of the April issue and check it out. Super Secret Stuff: Please don’t tell but, I found this secret, hidden link to the Chef Bill story online. Do you think Editor Elizabeth Hudson knows about this? Read the article at this link about Chef Bill Smith and Kibbe. Kibbe was a totally new dish to me, something I’d never even heard of, let alone tasted. I had to ask Chef Bill what was in it before I dug into it. Seems its made of Bulgur Wheat, Onions and some type of red meat like beef, lamb or, goat. Chef Bill was honest enough to tell me he wasn’t sure what meat was used in the dish being served that night. I think the dish was prepared by friends of his from another nearby restaurant. It’s not something I’d go out of the way to find but, it wasn’t terrible either. I’d liken it to something like a drier textured Liver Pudding if you’re from the South enough to know what that’s all about. It was a little bland for my personal taste. 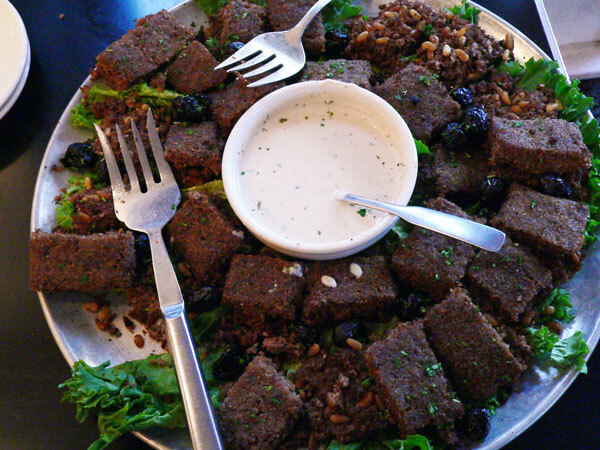 You can also learn more about it here… Kibbe or Kibbeh, on the Wikipedia website. On the other hand… this was more like it for an old Southern boy. Another table was spread with lots of Deviled Eggs, more on those later. There was a veggie tray, wafers, cheese straw like crackers, made in the shape of a pig and, some delicious ham biscuits. The ham had been cooked in a Coca-Cola glaze type of recipe and was really good. I’m getting hungry. Then, there was the dessert table. A beautiful poster displayed a page from the magazine and an article about The Deviled Egg Dish. We… OK… I (as in me) ate a fair share of the Deviled Eggs that were served. I’ve always been a fan of Deviled Eggs but, more on those later. 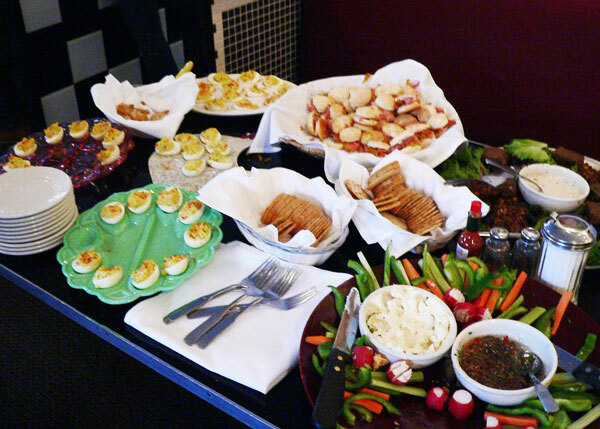 The above photo shows the dessert table after it had been attacked more than one time. I’m not saying I did that all by myself mind you. I must apologize that I can’t tell you the name of the cake that has all but disappeared in the photo above. If you look closely, you will see a few scraps of it left. Don’t get the wrong idea though, the Brownstone Cake at the top of the plate disappeared shortly after I snapped this photo. They had to bring out another tray of both after that. Again, Brownstone Cake wasn’t something I had ever tried to my knowledge. I’m beginning to sound like I’ve led a sheltered life all of my life thus far huh? But, thanks to one of our readers and subscribers to the Taste of Southern Newsletter, I had at least already heard of Brownstone Cake. You see, about a month ago, one of our readers asked me about Brownstone Front Cake and suggested I might do a recipe for it. Up until then, I hadn’t heard of it. Turns out its a very delicious cake and I’m going to be working on a recipe for it very soon here on Taste of Southern. Search our Recipes for it and give it a try once I get it posted. Brownstone Cake, even though its a Chocolate type of cake, only has a very small amount of cocoa or chocolate squares in it to make it. Chef Bill just happened to mention to me that Brownstone Cake only had about three Tablespoons of cocoa. It goes back to days when chocolate and cocoa were pretty scarce I think. Photo Property of Julian Charles Photography. 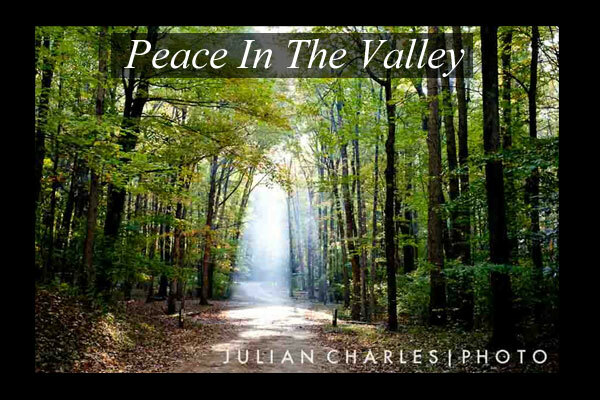 One of my favorite sections of the April Issue is a beautiful Photo Essay entitled “Peace In The Valley.” It features photos by North Carolina Photographer – Julian Charles. Originally from New Zealand, Julian Charles offers Commercial, Wedding, Portrait and Tourism photography services. Please visit his website and take a look at all the great pictures he’s posted online at: Julian Charles Photo. Its a true delight for the eyes. As it turned out, I had seen a Tweet about this article just hours before I left for the Launch Party. I visited the Julian Charles Photography website and spent a good amount of time that afternoon looking through all of his photos. I was sitting next to the dessert table, enjoying my plate of Brownstone Cake, when a young gentleman came over and spoke to me. I had spent most of the night in that chair because as I mentioned, the legs just don’t work like they use too. I was holding my camera and juggling my plate of food when this fellow introduced himself as… Julian Charles. I quickly recognized the name as being the photographer whose website I had recently been admiring. He asked me if I was a photographer but, I’m sure, he already knew that I wasn’t. We chatted for a few minutes and exchanged business cards. I was even more surprised the next day when he sent me a very nice Email. You’ll just have to get the April issue of Our State Magazine to see the photos and read the stories, I’m afraid I don’t have a secret link to the photo essay. 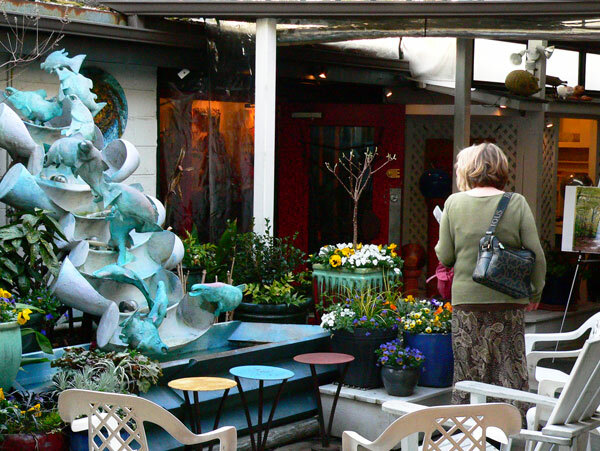 And this… this is the outside front of Crooks Corner Restaurant. 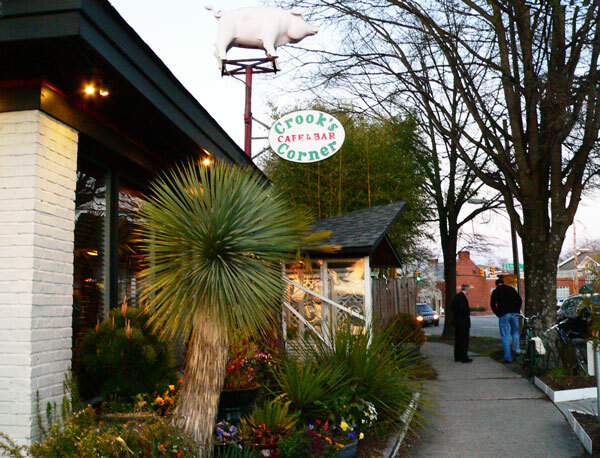 It’s located on Franklin Street in Chapel Hill and depending on which way you approach the building by car… you might have a hard time seeing that pig up top. Seriously. I may have rode by it at least once myself. Just saying. The famous pig is pretty well hidden in the trees, even in the Winter. But…just look for the hubcaps. ??? 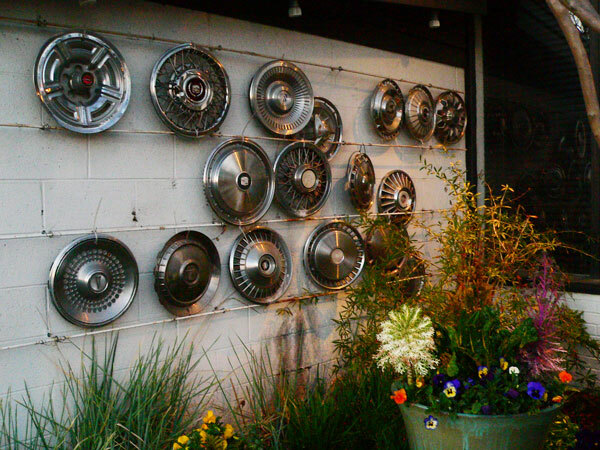 That’s right… HUBCAPS. They were on the side walls to the restaurant. Its a wild guess but I’m supposing these may have been found in the yard of the restaurant over the years. I could be highly wrong of course but, it would make sense I guess. Folks turning the corner too sharp could have a hubcap come off and roll up into the grass of the restaurant. Then again, maybe I should have just asked Chef Bill Smith the meaning behind them all. It’s Chapel Hill though… hmmmm. There are so many other great articles and stories in this issue of Our State. While this one was based around Southern Foods across North Carolina, you’ll find it a smorgasbord of reading both in the print issue and online. 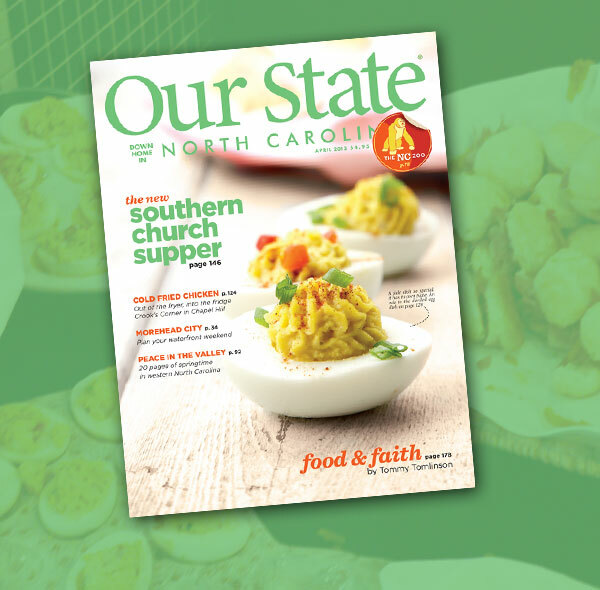 Check out this link to see a lot of the April articles, stories and recipes that are featured each month in Our State: Down Home in North Carolina. You might even want to subscribe to it yourself. OK… we’ve come down to the part about Deviled Eggs. As you can see, there is a very nice photo of them on the cover of this April-2013 issue. There is also a really neat article inside about Deviled Egg Serving Plates. 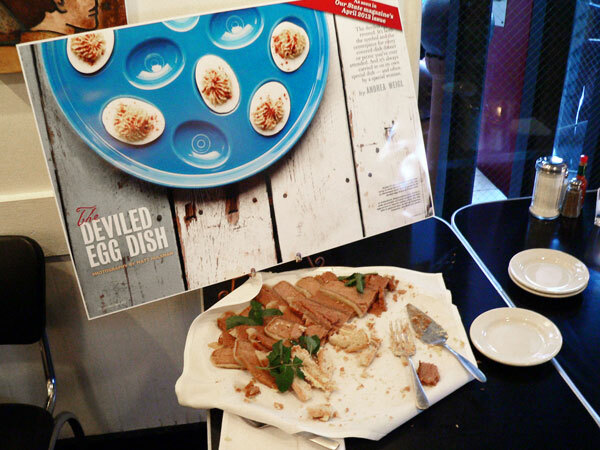 Deviled Eggs may be the only food item that has it’s own very special serving dish… or, plate. And, there’s a really neat part about a lady in Wilmington, North Carolina that has a collection of over 800 different Deviled Egg Plates. She’s working on acquiring a thousand of them and then she hopes to have it declared a world record. Super Secret Hidden Egg Stuff: Here’s a special link to read all about the Deviled Egg Dish. Its an article written by Andrea Weigl, Award winning food writer and cookbook author at the News and Observer Newspaper. Gosh, if Elizabeth Hudson finds I’m posting all these links to Our State magazine… I might get in trouble. Maybe I should stick with my own stuff. Deviled Eggs Recipe: Here is a link to the recipe that I did for Deviled Eggs in honor of the April issue of Our State magazine. It’s pretty quick and easy and, I think you’ll really like them if you just give them a try. I may have tried to emulate the cover of the magazine a bit with my photo above. As it turns out, I got an Email just a few days ago from Wendy Perry. Wendy is a subscriber to our Taste of Southern Newsletter and, although we didn’t actually meet, she was also at the Launch Party for the April issue. Wendy told me she does some of the food prep and styling for Our State Magazine and, its her Deviled Eggs that are featured on the cover. She had another cover, featuring a specialty cake, back in February of 2012. I’m so jealous… truly I am. Check out WendyPerry.com for lots of information about all the food adventures that Wendy is involved in. She’s a busy lady. Finally, thank you to Andy, Elizabeth, Chef Bill, Julian and all the other folks that I met at the Launch Party. I was honored to be invited and it was so nice to finally get to meet all of you. I hope you’ll keep me in mind should you ever do it again. I’m not a really socializing kind of guy when it comes to these type of events but, I still had fun. It was even nicer when I realized I had made it back to my car way down the street. Whew… I’m getting old. Your Comments: Are you a subscriber to Our State magazine of North Carolina? Isn’t it a great magazine? I’d love to hear your comments about the magazine or any of the things we’ve mentioned here. It will only take a minute or two of your time to leave us a comment. Please know that all comments are moderated. That means, I read each and every one of them before they are approved for our family-friendly site here at Taste of Southern. I also try to respond to as many of your comments as I can so be sure to check back again for that. Subscribe to Our Taste of Southern Newsletter: Each week, I send out a short Newsletter to let you know about our latest recipe or anything else that is going on in the life of Taste of Southern. Its just a quick reminder to keep you up to date. All you have to do is enter your Email address in the box below or, the box at the top right hand side of each page of our site. I’d greatly appreciate it and, I thank you in advance for your support. You also need to know that I will not share your Email address with anyone else.